Is Your PR Plan Current? Pr clients and publicity agencies are guilty of developing Publicity Plans for the year and forget to review the activity and analyze the results at least every quarter. We live in a fast paced world surrounded by constant changes in economy, products, businesses and jobs. Keeping this thought, it is a good idea that you review every quarter the publicity activities that your PR Plan had outlined. Make a checklist to see if the goals and results are in line with the objectives you specified. 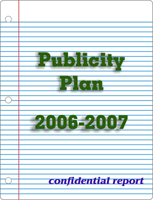 If you are working with a publicity agency, then call a meeting with them. Don’t call a surprise meeting; tell them in advance what the meeting is about. Let them know that you want to review the overall publicity program and compare the results. This is also true if you are doing publicity in-house. Give your pr staff time to document and collect what you need to make a clear evaluation. A mistake companies make when implementing a pr campaign is the lack of patience. Because things are moving fast, we tend to feel that publicity runs at slow pace. Publicity is not something that happens overnight. Nor are the results. Unlike running an ad, which can be monitored and scheduled for print, a publicity campaign requires patience and planning. Working with the media and all the different editors, publishers and Internet pr services can be rewarding when the plan is given its due time to get the results. After reviewing the results of the pr plan, discuss with the staff what needs to be changed in the PR Plan. Keep in mind to not make a 180-degree change, unless drastic changes occur in your industry or economy. Make changes that will best achieve the results you want. By keeping your focus on the original objectives will allow your plan to go in a positive direction to gain positive pr. Publicity is more than a form of media. It is an art. Knowing your target media and the industry is essential in developing a good and successful publicity program. Just as important is knowing how to speak to reporters, journalists and editors. Choosing the right words when talking to these people can help you gain favorable publicity. But before you can speak to these media reporters, you need to send pr releases, articles or stories to them to get their attention. That means the written word is powerful. It can make a reporter contact you to further learn about your product or service, or it can be tossed out like most releases. Learn what to say by choosing the right words is something that everyone needs to know. One person in particular, Ann Wylie has several tips on how to prepare and write a release. Some of the issues she explains are: Write a Feature lead; Lead with Benefits; Try a Tipsheet; Give a Bio and use Human Interest to name a few of her suggestions. I tend to agree with much of that information. Another great source in learning better public speaking is Arie Galper. Although he teaches you how to "Unlock The game" for sales calls, he has a vast of experience in teaching people how to present themselves, which can easily be applied when meeting with the media. After learing these powerful lessons, you need to make sure that you have a PR Plan in place. I strongly believe a solid publicity program coupled with your on-going marketing program will create a successful image. And that’s what you should be developing. The results of a positive image will then build the business. To implement a PR program, seek the help of a professional company. There are a lot of good pr firms who can help you achieve your goals. If you need help in finding one, contact us. We will direct you in the right direction, whether we can do it for you or find a company that best meets your requirements.